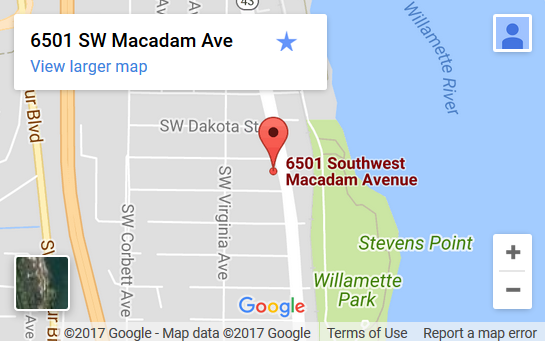 6501 SW Macadam Suite E Portland, OR 97239See the google map link to the right for directions to main office. Our new office has disability access in the conference room by appointment and parking in the lot and/or street parking. The cross street is Nebraska. Tri-met buses #35, the Macadam/Greeley bus, and #36, the South Shore Bus, both stop directly across the street from our Main office on Macadam. Bus #43, the Taylors Ferry Rd bus, stops at Virginia and Nebraska, a block west from our office on Macadam. Verify that this bus stop is in service, as it may be temporarily shut down.